Here are some fun self-care recipes for Valentine’s Day! Epsom Salt Bath: This will help detox and destress you from your everyday life plus it will help soothe your muscles. I gave my feet an Epsom salt bath last week after the kiddo’s birthday party. Sugar Lip Scrub: Growing up, I had the most terrible chapped lips that were always peeling so this is something I like to do on a routine basis to help my lips stay smooth and soft. Clay Facial Mask: This is made with Bentonite clay which has a ton of nourishing properties for your skin to get you back to glowing. Strawberry-Lime Sugar Scrub: This is one that will make your skin as soft as a baby’s bottom. It also helps your skin feel bright and fresh. Bergamot Foot Mask: Feet should not be out of mind just because they might be out of sight. Don’t forget to show them a little love too. 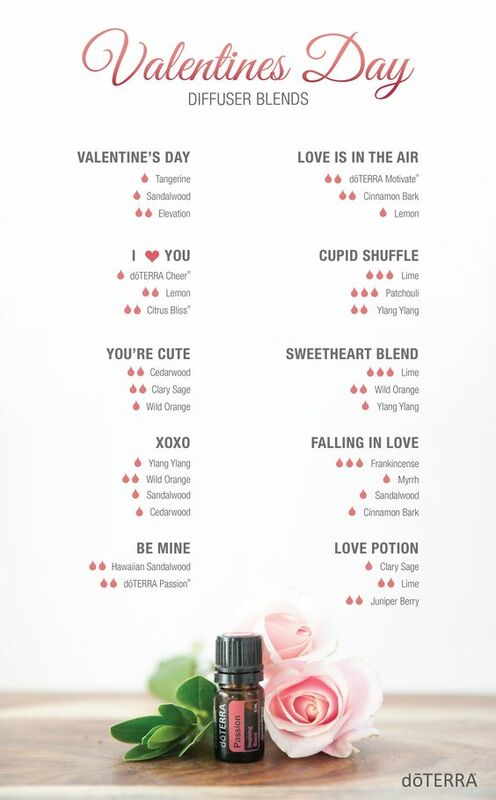 Use one or more of these diffuser blends!